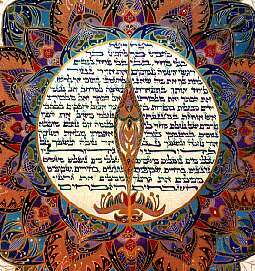 Orly Lauffer, the world renowned Judaica artist, was born in Israel, in the Mediterranean port city of Haifa. Orly's work, strongly influenced by Islamic and Persian motifs, resonates with her Moroccan ancestry. Indicative of Orly's style is the emphasis on minute details and intricate border work that is reminiscent of Arabesques. She is generous in her use of gold and silver in her detailing. Based in Jerusalem, Israel, Orly has customed designed Ketubot and other commissioned works of Judaica for an international clientele for over 10 years. Applying her professional experience, Orly designs each Ketubah so that it reflects the personal tastes and preferences of each couple. The bride and groom are involved in the creation of their Ketubah. The Ketubah text may be written in traditional Aramaic, or alternatively in Hebrew, English or French, producing a beautiful piece of Judaica art. All aspects of this magnificent, custom-made creation reflects the souls and inspiration of the bride and groom. Orly will also design for you magnificent wall illustrations using your choice of Biblical verses or other Judaica themes. These pieces make excellent memento for home, office synagogue or school, and can serve as a constant reminder of Israel, the Holyland. Orly also produces truly remarkable family trees with illustrations that reflect the history of the family or other Judaica themes. View samples of Orly's work.